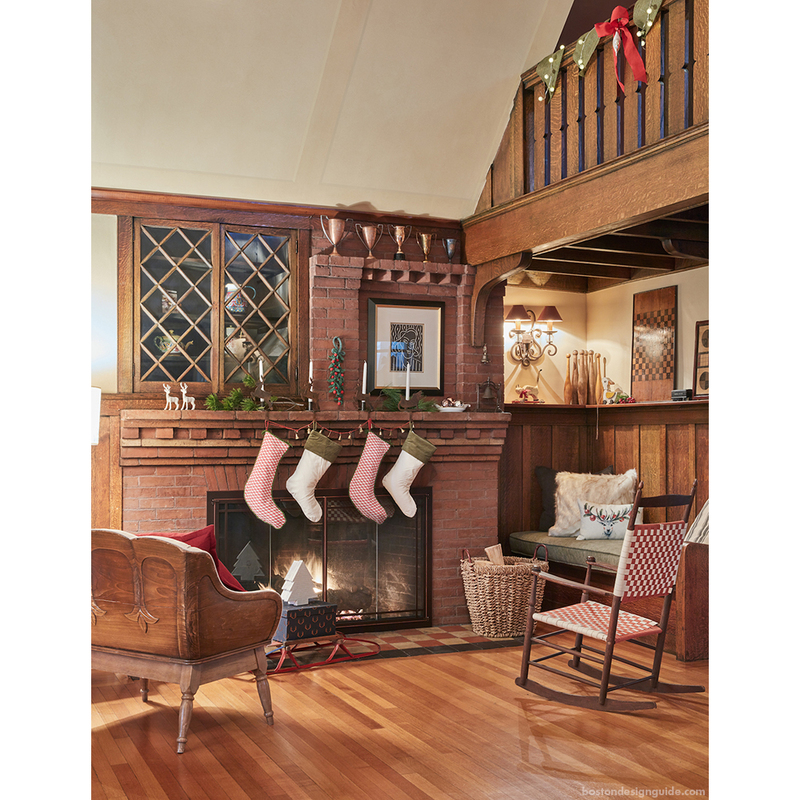 Every year, the Concord Museum reaches out to designers in the Boston Area to decorate stately Concord homes for the holidays. Tickets are sold to the public and the proceeds benefit the Educational Program at the Museum. This year, on December 3rd, there were 950 attendees. Barbara Elza Hirsch of Elza B. 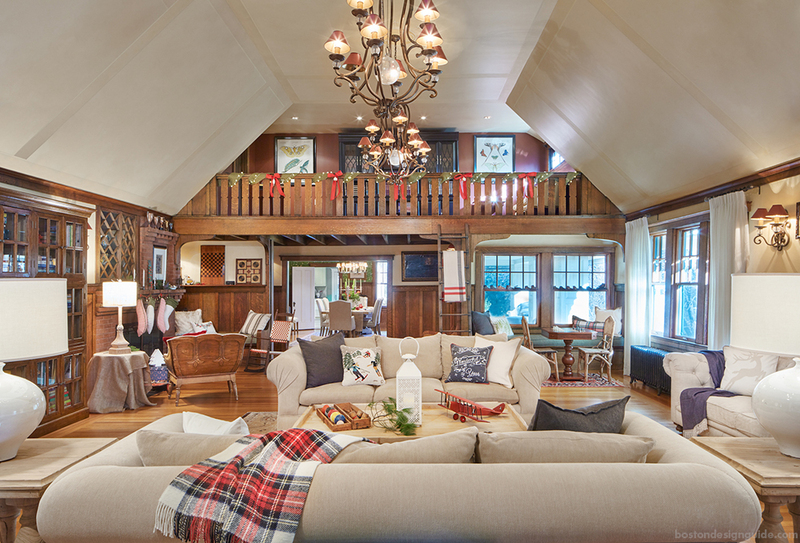 Design Inc. decorated a 1900 Arts and crafts home. 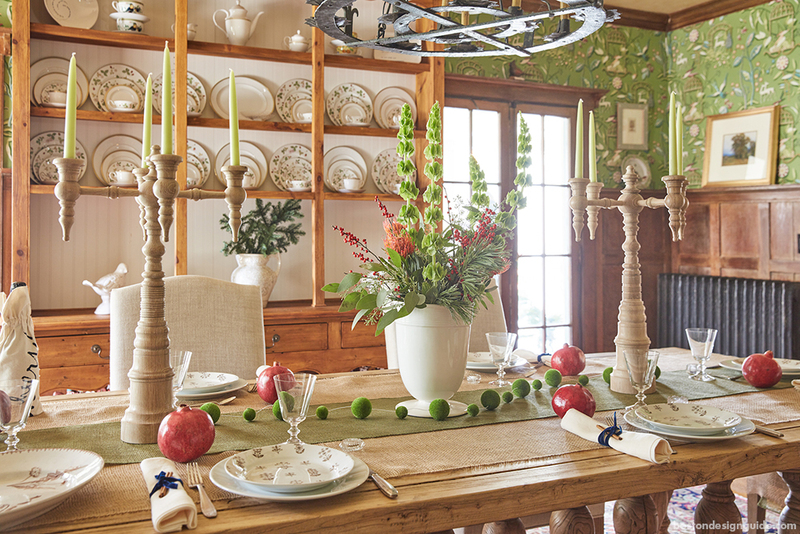 She created a rustic and organic Christmas décor with an Old-World Feel. Colors in her scheme complemented the owners’ décor, and she used accents of beige, white, navy, green and red. This unusual grand Craftsman home welcomes you in with its bluestone front terrace, into a magical home reminiscent of a winter wood lodge. The front door was adorned in a handmade swag free-flowing greens and bells and a large tartan bow. 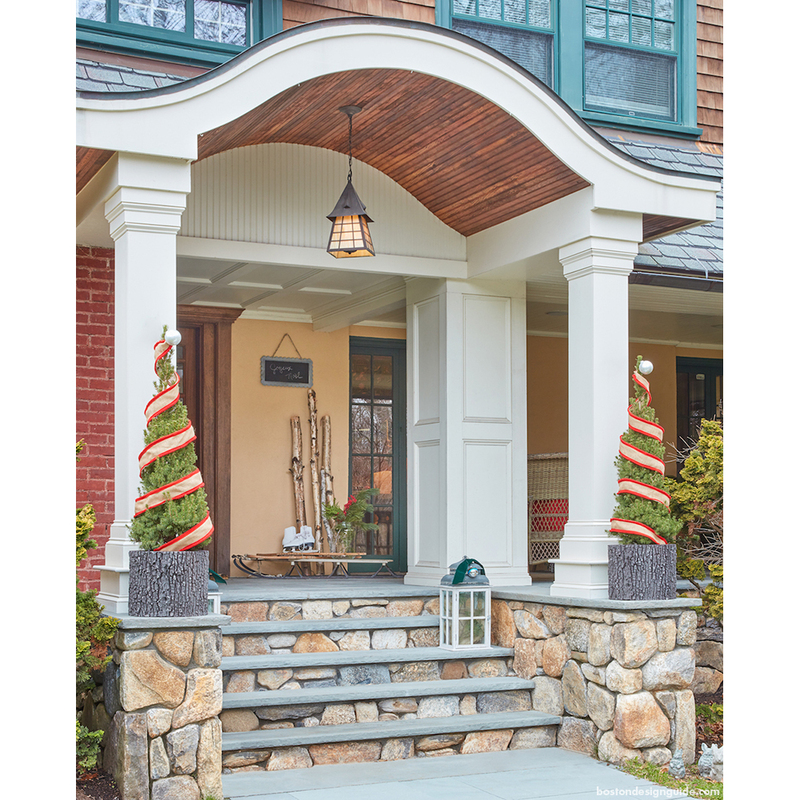 The antique skis and sled, with white skates and birch branches makes the porch pop. Oak paneling and dramatic balcony and ladder overlooking into the Living Room set the atmosphere. The cozy inglenook fireplace area allows one to travel into time to a quieter era. Barbara incorporated small white and sparkly reindeers, white candles and lightly colored stockings to brighten up the mantel. The small felt holly and leaves swag hanging against the brick is from Greentail table. The Christmas tree was adorned with birds, mercury glass balls and burlap and cranberry garlands. The garland wrapped over the reading mezzanine banister, which overlooks the Living room, was composed of green burlap, mini lights and abundant red bows and vintage looking ornaments. Antique sleight by North Bridge Antiques. 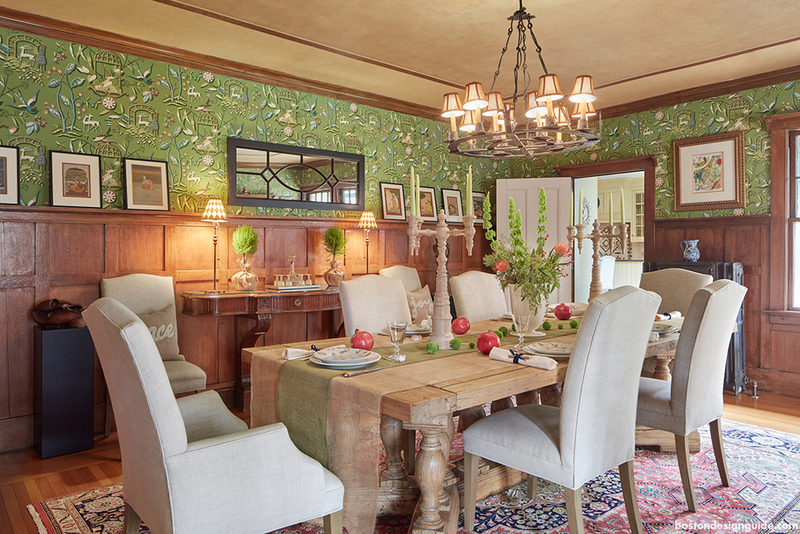 The dining room with its joyous Naïf green wallpaper William Morris pattern and oversized weathered wood table invites you to sit and enjoy a delicious holiday meal. The burlap runner and abundant greenery Barbara created set the tone for a rustic table open to nature, with quirky details blending Finnish antique plates, French silverware, glassware and Pomegranate fruit. The beautiful limed oak candelabras by Dunes and Duchess make the table shine. Barbara designed a commanding floral centerpiece made of proteas, bells of Ireland, holly and evergreens. 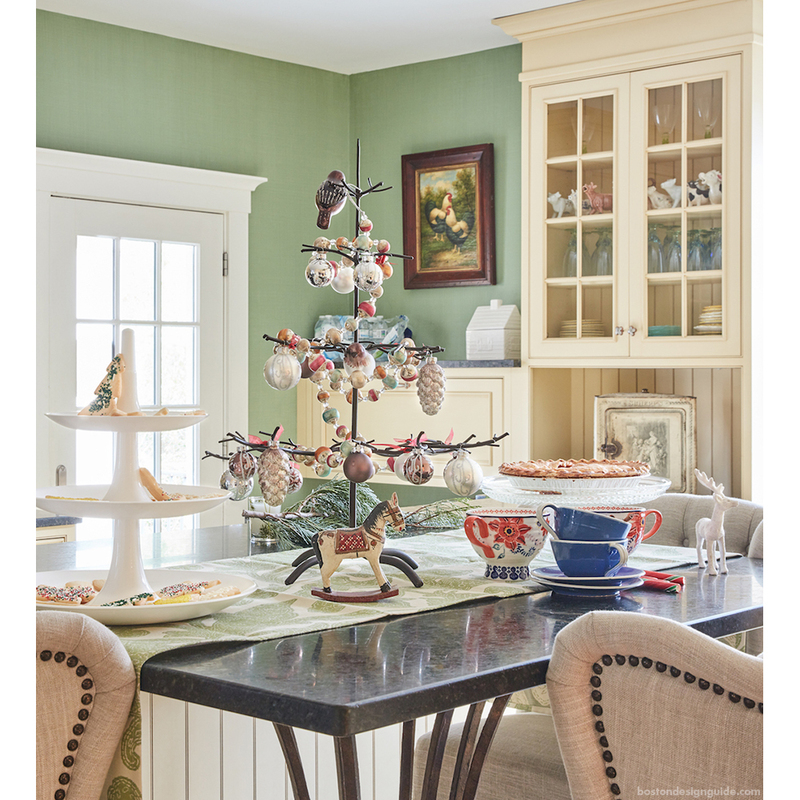 We created abundant holiday vignettes to usher in holiday cheer in the kitchen. Pinecones, cypress, pine branches, but also unusual greens, flowers and colorful fruit contribute to the festive feel throughout. Design: Barbara Elza Hirsch of Elza B. Design Inc.